Cook delicious pizzas from scratch to share with family and friends using the Bella pizza maker by Giles & Posner. With smart heating technology, the pizza maker works as a mini pizza oven to use in your own home, with the removable stone working as an evenly heated cooking plate for a satisfyingly crispy base. 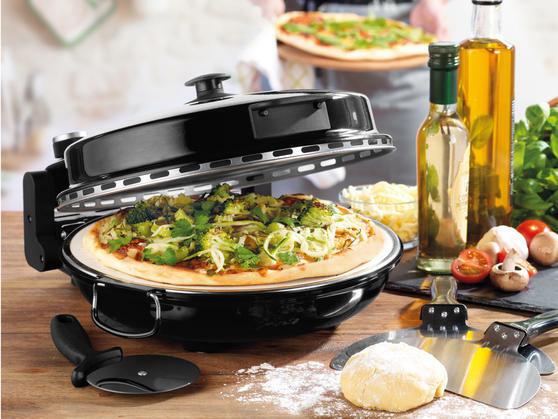 Cook your pizzas to perfection in just 5 minutes, with cooking speed standard ovens cannot compete with, the pizza maker has variable temperature settings and can reach up to 390 degrees. 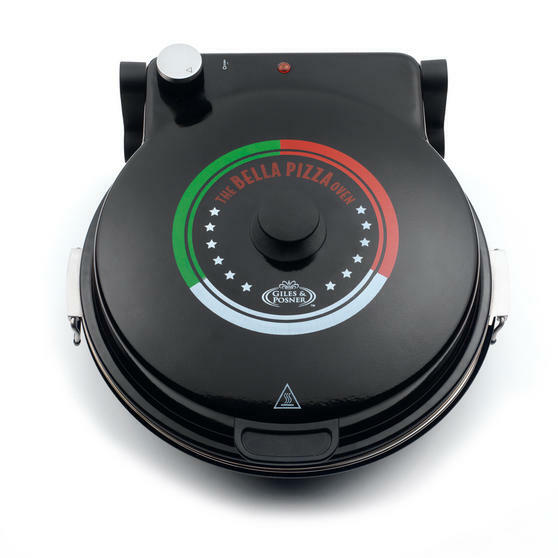 Impress your friends and family with tasty homemade pizzas up to 12 inches in size using the Bella pizza maker by Giles & Posner. Reaching up to 390 degrees so you can cook your pizza in minutes, there are different temperature settings to suit every type of pizza. A convenient pizza cutter and aluminium pizza paddles are included so you can easily serve your pizzas with a professional finish. The removable stone provides an evenly heated cooking plate, which absorbs moisture within the oven for an irresistibly crispy base. Throw a pizza party for your children and guests, let them roll out a base and customise with fresh toppings for a personalised meal.